Remember when every kitchen came with a cast iron sink? Maybe you’re too young and have grown up with its replacement: the stainless steel sink, the “little black dress” of the modern kitchen. It goes well with everything and always looks good. With stainless appliances being such a big part of the modern style, the classic stainless steel sink is more popular than ever. Many clients consider the kitchen sink as an uninspiring element, not really worth the time to explore all the options available out there. After all, a sink is a sink, right? Well, not these days. 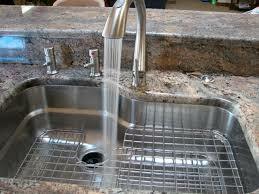 With all the recent advances in materials, technology, and accessories, today’s sinks are worth a second look. Think about the time you spend at the sink over your kitchen’s lifespan, it really is worth investigating all the options and choosing a sink that will be one of the highlights of your kitchen. 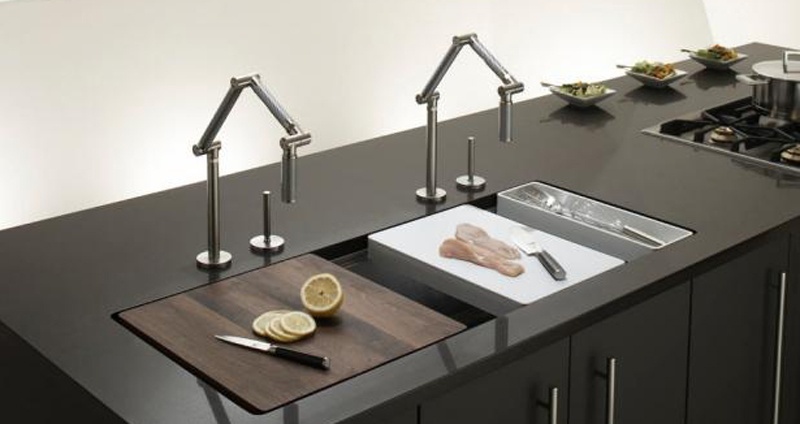 Additional features and add-ons can make your sink a food prep workstation as well as just the place where you wash dishes. If you can think of a shape, there is a sink to match it. 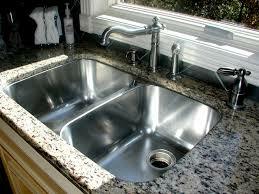 Specialty sinks of every shape are available if you want to make a statement. 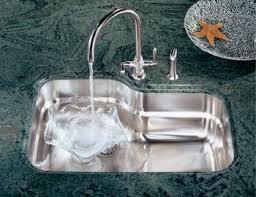 But typically, the main sink in a kitchen is chosen for its functionality. Most are rectangular or D shaped. How many bowls and the size of each is really a personal preference. If you like to wash in one sink and rinse in another, then a double bowl makes sense. Some prefer to keep a dish rack nested in the second bowl to avoid it being on the countertop. Many of our clients who have replaced older double bowl sinks opt for an oversized single rectangular bowl that allows them to soak those big roasting pans for a bit before cleaning. 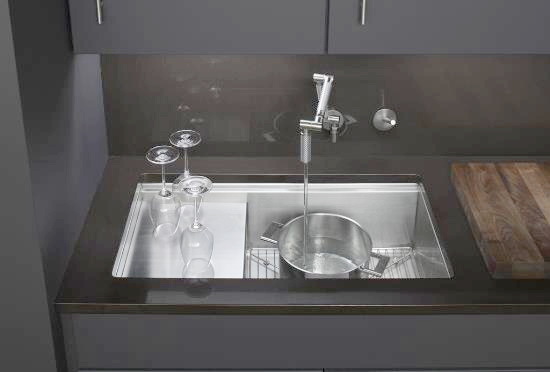 For someone who occasionally wishes for a double bowl, avoid the decision between single and double bowl by choosing a Dawn Sinks large 30" wide sink that has an acrylic glass divider for those times where you wish for a second bowl. It's an innovative solution! You can have your cake and eat it, too! Before you make that decision to go with a plain vanilla rectangular stainless steel sink too quickly, explore some of the other options out there. Those of you who really enjoy cooking may want to look for some additional features and add-ons that make food preparation easier. 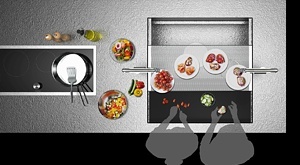 Franke offers in their Orca collection wide and deep sinks with a patented ridge along the inside edge just above the sink bottom that allows you to add full or half racks for drying dishes. 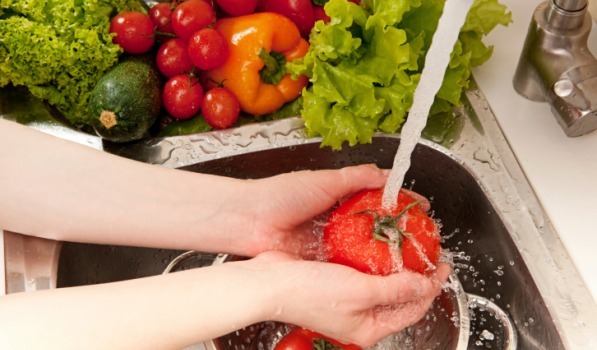 They also offer cutting boards with collander inserts that sit within the top rim of the sink allowing you to chop vegetables without taking up precious counter space. 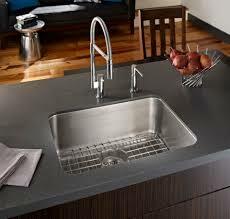 A recent contemporary kitchen we designed was outfitted with Kohler’s Stages 45 Model K-3761 stainless steel sink. 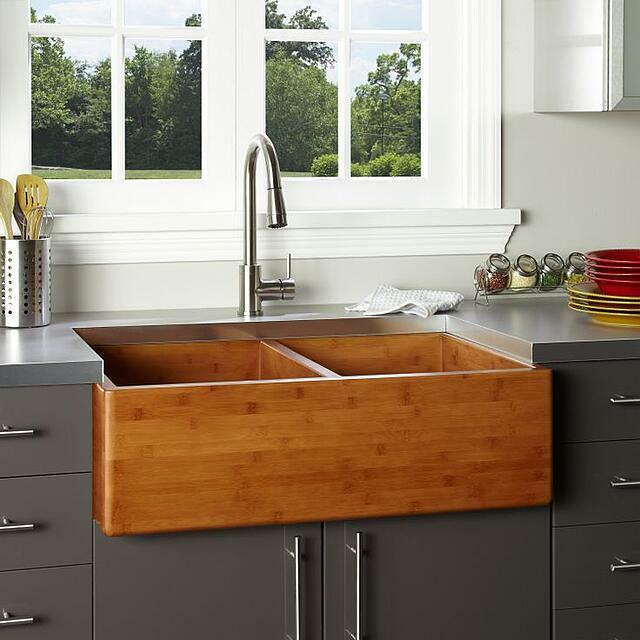 Designed for serious cooks, this large, deep basin sink offers ample room for cleaning. The unit has a variety of accessories including a cutting board that slides along the entire top, a basin rack, and six prep bowls with a tray for transporting ingredients to the stove. The stepped side platform extends directly over the pullout trash bins in the cabinet below. 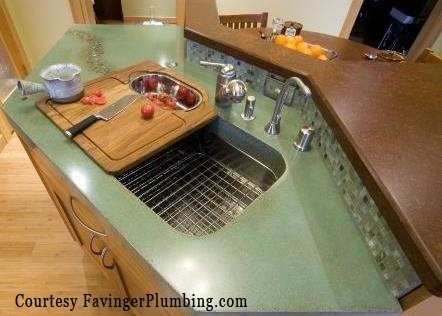 This area is perfect for cleaning produce or drying dishes as it is pitched to drain directly into the sink. When it comes to the depth of a sink, the standard is 6”. Deeper 9” sinks are very popular today, possibly because some feel a shallow sink can make hand washing dishes a messy business. But extended periods of leaning into a deeper sink may cause pain in your lower back. It's really a matter of personal preference, with no one depth being ideal for everyone. 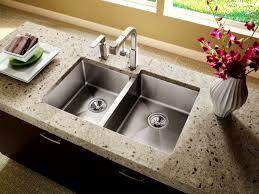 When selecting a depth, keep in mind that undermounted sinks add another 1 1/4" to the depth. 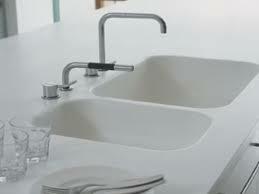 One clever way to deal with this depth issue is Toyo's 3D sink. 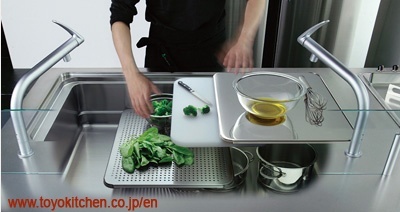 It's a multipurpose unit with adjustable height slide plates and cutting boards. This allows you to stand in a comfortable posture and do a lot of things without a lot of lateral movement, changing the depth to the "most natural position" based on the task at hand. To knead dough you can use a low position, and cutting ingredients can be done at or closer to counter level. The newest offering from Toyo is Parallelo. It's a 30 x 30 square sink with two faucets, intended for two people to use it, side by side, at the same time. What a great opportunity for culinary collaboration. The surfaces that you use for prep slide out of the way to provide a clear opening when you want to use the sink for its original purpose. This is a game changer. Chosen for their timeless appeal and great performance, stainless sinks such as these will not crack, chip, stain, or show rust. They actually improve with age as they take on a soft, lustrous patina. Thicker gauge steel will be less susceptible to denting and noise than those of a thinner gauge with better sinks having sound deading material sprayed on the underside to minimize that "reverb" sound. Farm sinks have come in from the barn and gone beyond use in country kitchens as manufacturers now offer them in sleek designs that work as beautifully in contemporary spaces at they do in traditional homes. Our clients love them. Not just because they are available in a wide range of materials and look "cool", but because they are spacious and easy to work in. Since they are not set back into the counter, you don't have to hunch forward as much to wash the dishes. 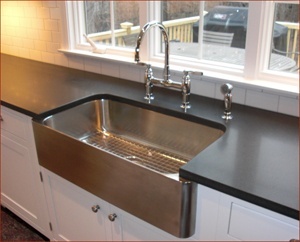 Stainless - For a young New Canaan couple we chose the Kohler Verity model K-3086 to add a twist to a traditional design. Fireclay - The newest material in luxury is actually centuries old. Authentic fireclay is durable, beautiful...and most importantly, versatile. It looks great, is a "white white" and endures for years. It's a material that won't chip, stain, or fade. The Blanco Cerana comes with two different corner styles for its apron front, making this reversible fireclay sink a perfect fit for both traditional and contemporary kitchens. 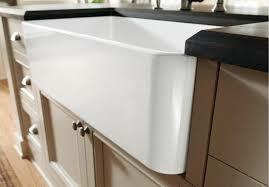 Rohl's Shaw Fireclay sink is another favorite of ours. Copper - The Stone Forest Copper Farmhouse Sink is created from heavy 16 gauge copper sheeting and is virtually indestructible. 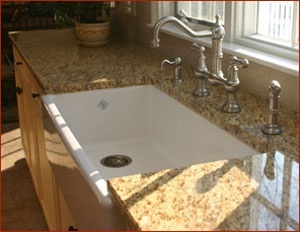 One side of the sink is hammered and the other has a smooth front apron so that you can choose which surface to display. The copper is hand patinated and has a living finish that will patina and change color as it ages. Unlike other brands (which are single walled with the exception of the front apron), their Copper Farm Sink is double walled on all sides. 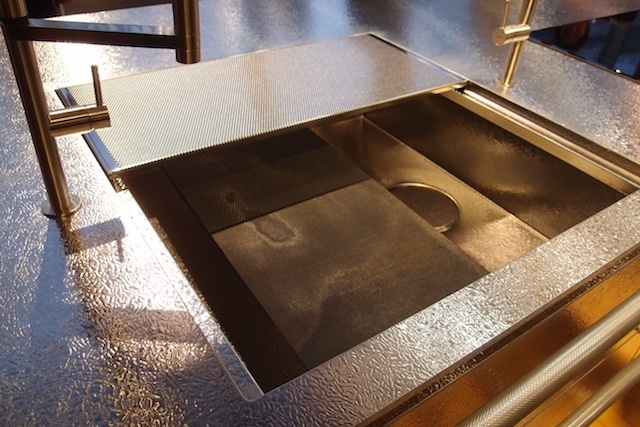 This allows them to foam-fill the sink, which reduces reverberation (other copper sinks generally sound "tinny") and gives the sink a pleasing, substantial feel. Additionally it enables a number of mounting options including under-mount, flush mount, partially elevated and above counter. 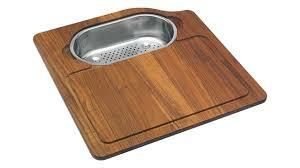 Bamboo - You might not have expected to find bamboo being used as a kitchen sink material. Although it requires a little extra TLC to maintain the rich luster of the bamboo, it's a beautiful green option. Maintenance consists of the occasional application of carnuba wax to make the removal of hard water deposits easier to remove and resealing the wood with a sealer such as Okan once a year. Stone and Cement - Whether fabricated from individual pieces or carved from a solid block of granite, marble, or soapstone, these are truly statement pieces. They are available ready-made or we can have them custom made to include a custom drainboard, or your own design on the front apron with everything from a Celtic pattern to your own monogram. Keep in mind that the weight of these sinks can present some unique installation challenges and may not work in every situation. Since stone and cement are porous materials, the daily exposure to soap and water will require more frequent resealing than your countertops. A honed or brushed finish will reduce the visibility of surface scratches. Cast Iron - If your last memory of a cast iron sink included chips along the top edge, you may want to revisit today’s version. Kohler feels so strongly about their enameled cast iron sinks they guarantee they won’t chip, crack, or burn. Want to learn more? Go to Kohler.com to watch a video showcasing the design possibilities of their enameled cast iron products. It's a legendary look that keeps on ticking. Composite – If you want the look and feel of a stone without the risk of scratches and chips, you may want to consider one of the hybrid materials available. SilGranit ll from Blanco is made up of 80% natural crushed granite. Similar to an engineered quartz counter, the stone is combined with a bonding agent. 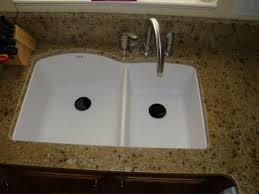 The sinks are formed in various shapes, sizes, and colors that resist scratches, stains, chips, and heat. As the material is colored all the way through, it won’t fade in sunlight and is impervious to household acids. This advanced surface technology also makes it non-porous, easy to clean and extremely hygienic. 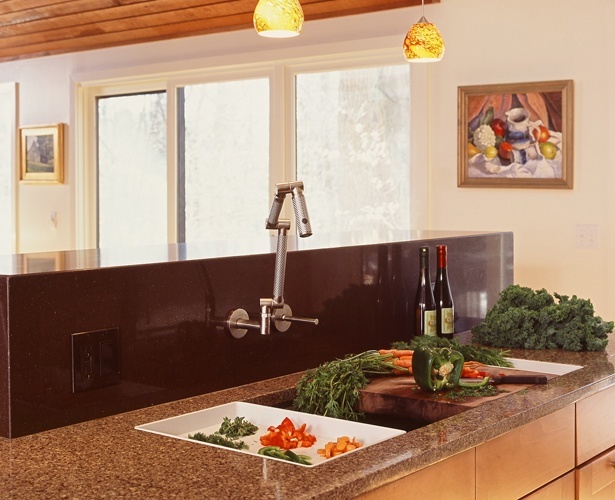 Solid Surface – If you prefer a material with a softer feel, that is non porous, stain resistant, and low maintenance, you may want to consider a Corian sink. Originally intended for seamless integration with their countertops, they can also be undermounted to your stone counters. The Corian Vaso Collection is available in various sizes, shapes and colors. 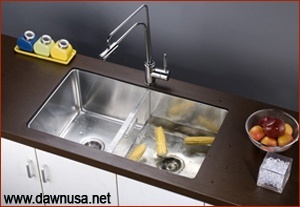 We like the 966, which is a good sized rectangular sink at 27 1/2" x 15 3/4" x 8". Like everything in life, it’s all about choices. Whether your style is cutting edge or classic, there are beautiful options to be had. 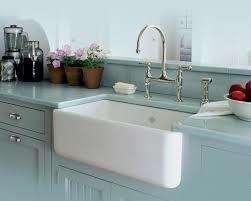 Don’t treat choosing a kitchen sink as a trivial exercise. 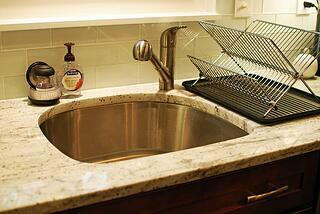 Discriminating cooks, savvy hosts, and busy professionals all know the value of a great sink. Do a little research, ask the experts, and explore the options. You’ll be glad you did.